Over the first two quarters of 2010, private equity fund interest in small and medium sized companies has been noticeably stronger than at almost any period on record. Some of the drivers are common to the recovery phase of past cycles. However, both the level of activity and the nature of the targets are unprecedented so early in a recovery – arguably the result of the record overhang of dry power (uncommitted capital) remaining at private equity funds. As highlighted at recent PE industry gatherings and in the financial press, the combination of record amounts of funds raised prior to the economic crunch in the late 2008 (Exhibit 1), followed by the abrupt disappearance of available debt financing and the ensuing decline in buyout activity for the duration of downturn, has created a mountain of un-invested funds (Exhibit 2). This supply of capital is significant, particularly so given that the clock is ticking to put it to work. Because of the typical requirement that private equity funds invest uncommitted capital within 5 years, there are a series of such anniversaries on the immediate horizon prior to which the funds must be spent or relinquished (barring extensions from limited partners). The 5–year anniversaries of the 2005 vintage funds are already here, with the expiration “cliffs” growing significantly in 2011 and 2012 (see Exhibit 3). The incentive to put this money to work, coupled with banks’ continuing reticence to commit capital in concentrated chunks for the mega deals of years past, is fueling an environment where middle market companies are the main beneficiaries of one of the most attractive markets on record for raising expansion capital or for outright sales. 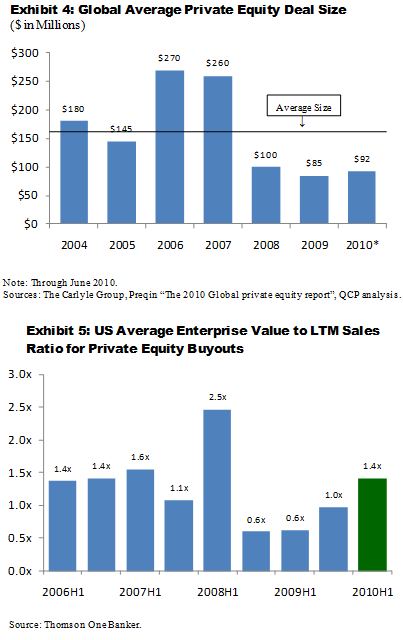 The combination of (very) well funded suitors and renewed availability of complementary debt (for more modestly sized transactions) has created an opportunity for PE firms to utilize leverage to generate acceptable equity returns even while paying compelling prices to sellers. 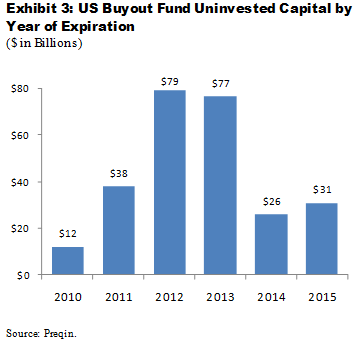 The average buyout remains below the $100 million mark (Exhibit 4). While that may have been a reflection of distressed sellers and compressed valuations in late 2008 through 2009, valuations in 2010 have rebounded well beyond levels normally seen early in a cycle (Exhibit 5). 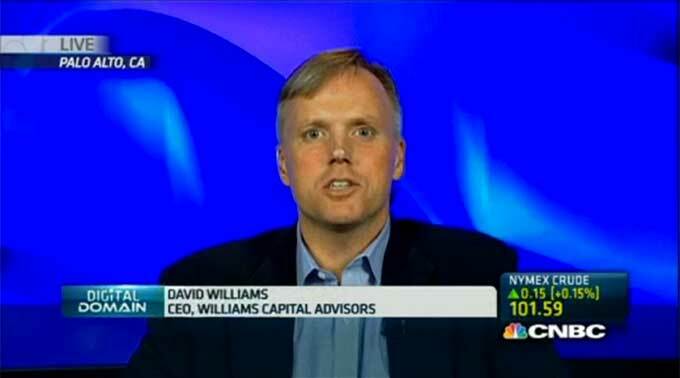 Some private equity firms are seeking extensions to provide for more time to invest funds with approaching anniversaries (see “Limited Partners Fear Coming ‘Distressed Buying’ Boom,” WSJ…). Some such extensions may be granted, but the overall volume of investable dollars tied to expiration dates is so large that effects will continue to be felt in the marketplace for some time. Even as individual funds approach their 5–year anniversaries, we’re unlikely to see eye-popping valuations driven by a use-it-or-lose-it mentality. Instead, we’re likely to see a continued shift towards a sellers’ market as competition for a limited number of financeable companies continues to heat up. For middle & lower-middle market companies, the most visible impact is already apparent in valuation multiples. Not only are valuations rising rapidly on an absolute basis, the historic gap between prices and paid by strategic acquirers relative to financial buyers is narrowing and financial buyers are increasingly the winning bidders for Silicon Valley companies (Exhibit 6 and 7).